This post-Easter weekend was full. Of work. Desk work. Farm-and-garden work. Mountain-biking work. And it was slightly chilly. Which means, come dinnertime, what we really wanted was a bath and a hot meal afterwards. Roasting something is perfect since it usually doesn’t take much prep. You chop, you season, you stick the food in the oven, and then you go soak while it cooks. You might have to slip out of the tub to turn something halfway through, but that’s doable. Here’s one of those easy, too-tired-to-cook meals. Roasted Cabbage Steaks & Brown Rice. Don’t let this meal’s monochromatic looks fool you. It is damn good and my sweetie says so several times over through a meal. Roasted Cabbage Steaks & Brown Rice. Flavor abounds in this plain Jane-looking meal. When the rice and cabbage are all done, pulling it out of the oven means savory aromas get you in their grip even before the first bite. Then you fork a piece. Roasted cabbage is toothsome, parts are sweet, parts are savory. The top, with crushed red pepper, is spicy. The rice is nutty, soft, and filling. It is to my mind, sublime. It’s also healthful, cheap, and easy. Sublime squared. 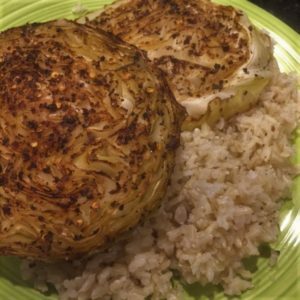 Roasted Cabbage Steaks & Brown Rice Recipe This makes 4 steaks, which for us serves two. Brown rice takes about 45 minutes to cook, plus or minus. Set up your brown rice in a rice cooker or on stovetop, timing it to be done same time or just before cabbage steaks, which take an hour. Slice cabbage into 4 one-inch thick steaks. Lay the steaks on parchment paper on a cookie sheet. Brush the cut sides with a little veggie broth, or water. On top the cut sides, sprinkle coarse salt, pepper, and if you like things a little spicy, crushed red pepper. Put the steaks in the preheated oven and roast for 30-35 minutes. Remove the steaks, use a spatula to flip them, brush with water or broth and seasonings as above, and pop them back in the oven to roast for another 30-35 minutes. Serve steaks hot from the oven over brown rice. Enjoy! Note: If you’ve skipped the crushed red pepper, but still want heat, drizzle a little Tabasco or Sriracha over the dish.